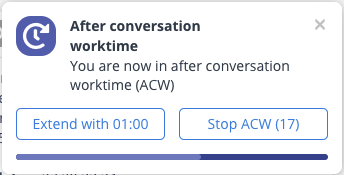 After a conversation has ended, there is an after conversation worktime (ACW) period of 30 seconds before the next conversation is offered. This ensures that the agent has time to resolve the case and write a wrap-up note about the conversation. You can extend the after conversation worktime by 1 minute or end it immediately. After Conversation Worktime can be between 5 and 300 seconds. When you save a wrap-up note for the conversation you automatically exit after conversation worktime. When an agent is in after conversation worktime a clock is displayed to next to the agent's name. There is no after conversation worktime for outbound and internal calls. Extend or End after conversation worktime. Rachel is in after conversation worktime, as indicated by the clock symbol.